Generally, investors enjoy streamers for their relatively predictable cash flows, minimal cash costs, low numbers of employees and low risk profiles. In this article, I will analyze five different streaming companies using five measures. Because gold price is of paramount importance for the "streamers" group, it is always highly recommended to associate any trading or investing with the future potential gold price. 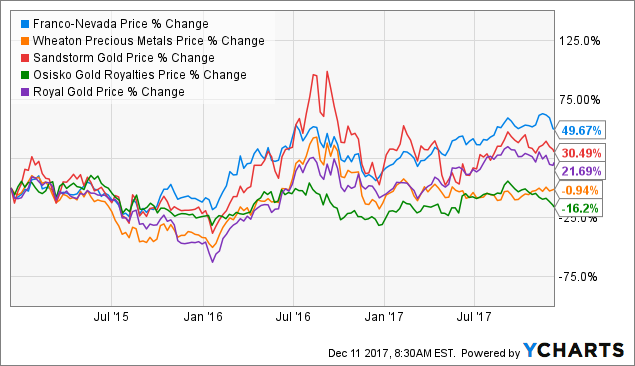 When you purchase a company in the precious metals streaming subsector, which I will present and analyze today, you also buy a team that concentrates on handling the risks associated with that commodity as extra insurance. That’s important to note, and a primary perk of purchasing a streaming company in the first place. Generally, investors enjoy streamers for their relatively predictable cash flows, minimal cash costs, low numbers of employees and low risk profiles. Furthermore, miners are attracted to streaming deals because they are not apparently dilutive like equity transactions, and they are also not damaging to their balance sheet. Thus, one of the best and safest ways to invest in gold (or other precious metals or even oil) is investing in royalty and streaming companies. You can access my individual articles about the recent Q3 results: FNV, SAND. Note: Bigger streaming and royalty companies, such as FNV and WPM, are more diversified whereas smaller ones such as Osisko Gold Royalties and Sandstorm Gold still face mine risks due to their diversification still in progress. According to Mining.com: Osisko Gold Royalties was formed in 2014 with the sale of its Canadian Malartic mine – the country's largest gold mine. In August the Montreal-based company closed a $1.125 billion deal for 74 streams, royalties and off-takes from private equity firm Orion Mine Finance. The transaction catapulted Osisko Gold Royalties into streaming’s top tier. However, the caveat is that this rapid expansion of the two junior streamers has not necessarily been good news for shareholders, who have often been slapped with rampant dilution and a tumbling stock price. Note: RGLD Q3 is the fiscal Q1 2018. (Source: Companies filings and Morningstar). Trends and Charts: Revenues, Earnings Details, Free Cash Flow, Dividend, and Production in GEO. In this segment, I will use six simple measures to compare the five streamer companies indicated above. I have demonstrated in the past that these six different aspects have answered adequately any personal attempt to evaluate a streamer company either as a standalone investment or as a comparison to a few of its peers. Let me share this analysis with you. Gold Equivalent ounce Production in K Geo. FNV reported very strong Q3 results. Revenues were strong and basically the same as a year ago. Oil and Gas represented 7.3% of the revenues this quarter. Revenues were up 4.8% sequentially. The company currently has 47 producing mineral assets generating revenue. However, the company had some troubles in Silver revenues due to Antimina this quarter. OR: The company's cornerstone asset remains the 5% net smelter return royalty on the world-class and long-life Canadian Malartic gold mine and Eleonore. On July 31st, the company acquired a precious metals portfolio of assets from Orion consisting of 61 royalties, 6 streams, and 7 precious metal offtakes for C$1.1 billion. This acquisition included 9.6% diamond stream on the Renard diamond mine and a 4% gold and silver stream on the Brucejack gold and silver mine, all of which are new high-quality mines in Canada, in addition to a 100% silver stream on the Mantos Blancos copper mine in Chile. RGLD: Reported net income of $28.6 million, or $0.44 per share, on revenue of $112.5 million in its fiscal first quarter ended September 30, 2017, compared to $118.0 million in the prior-year quarter. SAND reported total revenues for the third-quarter were $17.939 million with 64.3% in gold sales versus 67.2% in gold sales in 3Q'16. Total revenues were up 6.6% compared to a year ago and up 11.6% sequentially. A good quarter overall. New significant recent development: On October 25, 2017, Sandstorm announced that it has signed an agreement to sell $18.5 million in debt and equity securities of Trek Mining Inc., to Ross Beaty. Sandstorm has acquired a portfolio of 170 streams and royalties, among which 20 of the underlying mines are producing gold. The company is a junior mining streaming royalty in a process of building up a large portfolio. The company entered into a merger with Mariana Resources and owns a 30% share of Hot Maden project in Turkey which is a promising endeavor according to Masterinvestor. The caveat is that the company used equity to finance the deal and the stock tumbled on the news. This is not the first time that the company used its own stock to finance its expansion on the back of the shareholders. WPM: Revenue was $203 million in the third quarter of 2017, on sales volume of 5.8 million ounces of silver and 82,500 ounces of gold. This represents a 13% decrease from the $233 million of revenue generated in the third quarter of 2016. On September 30, 2017, the company had approximately $70 million of cash on hand and $854 million outstanding under the company's $2 billion revolving term loan. 2 - Free Cash Flow. Free cash flow is an important clue that should be always evaluated carefully when looking at a long-term investment. Basically, FCF should be adequate and positive if the business model can be regarded as healthy. Accordingly, it must be sufficient to compensate for the distribution, to reduce debt and to pay for eventual share buybacks. The situation for the five streamers is totally fine. Only one exception is Osisko Gold Royalties, which failed the FCF test. This is not surprising because the company was created very recently. Note: Net Debt-to-EBITDA is a measure of indebtedness of a company called a leverage ratio to assess borrowing capability. The net debt-to-EBITDA ratio is a debt ratio that shows how many years it would take for a company to pay back its debt if net debt and EBITDA are held constant. 4 - Gold Production and others. FNV: Gold equivalent production was basically unchanged compared to a year ago - very strong and steady performance, as the chart shows above. The stream costs have increased because the company is delivering more stream ounces, which is a positive. For instance 89K Au Eq. Oz was coming from the stream or approximately 72% of the total production. For Q3 2017, the cost per ounce was $300/Oz leaving an operating margin per GEO of $978/Oz. This is slightly higher year over year, due mostly to the fact that most of the production came from the stream. On the oil and gas segment, Franco-Nevada acquired oil & gas assets for a total of $110 million. Also, FNV recently signed a purchase agreement for $110 million for the acquisition of royalty interest in the Delaware Basin of West Texas. The acquisition has an effective date of October 1st and the company anticipates closing will occur later in February 2018. OR: Posted a record quarterly gold equivalent ounces earned at 16,664, of which about 5,500 ounces were from Orion acquisition discussed above, which represents a 65% increase compared to the same period last year. Cortez Crossroad with Barrick Gold (ABX) - 4.5% NVR & 5% GSR royalty. RGLD has 38 operating properties. SAND: Production of gold equivalent was up 13.5% compared with a year ago and 12.1% sequentially. These are some good numbers but I was expecting a total above 15k GeOz this quarter and I was a little disappointed. Bachelor and Karma may be to blame. WPM: Reported attributable production in Q3 2017 was 14.9 million SEOs or 195,900 GEOs, compared with 15.3 million SEOs or 225,400 GEOs in Q3 2016, a decrease of 3% and 13%, respectively. OR: Dividend increased the last two quarters to C$0.05. RGLD: On November 11, The company announced that the dividend will be raised to $1.00 per share yearly. SAND: One important element about Sandstorm is that the company has no debt and was able to repay its debt by issuing equity. However, the caveat for shareholders is that in issuing equity the stock suffered some immediate dilution. Nolan Watson, the CEO, said in the conference call that the company is still focusing on its share buyback program versus paying a dividend. I do not agree at all. With respect to question four relating to share buybacks versus dividends, as I discussed in our last conference call, we are maintaining our focus on share buybacks for now because we still believe that our shares are materially undervalued. FNV was forming an ascending channel pattern and experienced a negative breakout at the end of November, right after showing a double top (Sell flag). The next weak support is around $75 but the strong long-term support is at about $70. I recommend a Hold for FNV with a potential new accumulation below $73. However, if gold turns bullish end of December - which is not likely due to the FED raising interests - then FNV may eventually rally to $80. The stock began to tumble in September and October due to the announcement of a bought deal of Convertible Senior Unsecured Debentures of a total amount of C$300 million. This news had a strong negative effect on the price per share which is still falling as we speak. In my opinion, the nearest strong support could be around $10.25, however, a retest of the $8.75 level could be possible due to gold price entering a bearish period. RGLD is forming a descending channel pattern with $80 as trend line support and $87 as resistance. The descending channel pattern is often followed by higher prices, but only after upside penetration of the upper trend line. The stock will continue channeling downward until it is able to break either the upper or lower trend line. 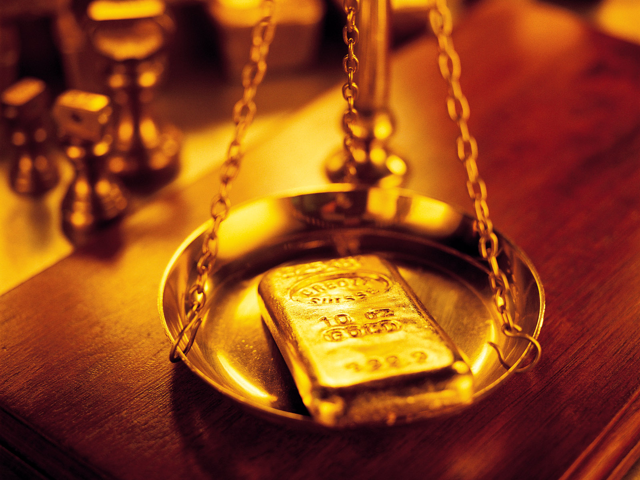 It is important to follow the stock in relation to the gold price. A penetration of the upper trend line is unlikely the next few weeks or even months which means the stock may eventually retest its strong support at $75 before resuming its uptrend. SAND was forming a symmetrical triangle pattern and like FNV had a negative breakout end of November. The stock successfully tested the support at $4.20 and seems to show a falling wedge pattern, which is bearish, with a trendline resistance at $4.50. I believe the stock will eventually break out on the negative side and will around $3.80, depending on the gold price. I recommend taking some profit off the table above $4.40. WPM is forming an ascending wedge pattern, which is quite bullish short-term but may signal a bearish midterm outlook. Any upside from $21.25 should be seen as an opportunity to take profit off the table and wait for some weakness under $20 if possible to accumulate again. This comparison study is interesting mainly because it shows that the "streamers" group is fundamentally composed of two distinct groups that may not give the same level of security and/or growth that a new investor could normally expect. On the one hand, you have the junior "streamers" that are eager to expand operations at a cost of an immediate and huge dilution for shareholders. The latter are basically are left holding the bag and wait for the stock to rise again, eventually, in the future. You can see the same situation with Osisko Gold Royalties, the new kid on the block, and Sandstorm Gold as well. Unfortunately, the potential benefits of these praised acquisitions can take a long time to produce a meaningful profit and besides some trading short-term, I do not recommend investing long-term in these juniors at the moment. On the other hand, you have the "strong ones" with an already impressive portfolio and solid internal future growth. Franco-Nevada seems the leader of this group but Wheaton Precious Metal and Royal Gold are satisfactory as well. The question regards the price: they are not cheap, and the dividend is not sufficiently high to celebrate. This second group is considered friendly from an investor's perspective and appears to be the best and the most secure business model. The only question lies in pinpointing the right timing to accumulate safely and expect a quick and decent profit. This is not an easy task. Because gold price is of paramount importance for the "streamers" group, it is always highly recommended to associate any trading or investing in the future potential gold price. I personally believe that gold price will continue to stay bearish until the end of the 1Q'18. Important news: Do not forget to follow me on the gold sector. Thank you for your support, it is appreciated. Disclosure: I am/we are long FNV. I wrote this article myself, and it expresses my own opinions. I am not receiving compensation for it (other than from Seeking Alpha). I have no business relationship with any company whose stock is mentioned in this article. Additional disclosure: I trade often the sector.